Do a penny test. Are you sure you need new tires? 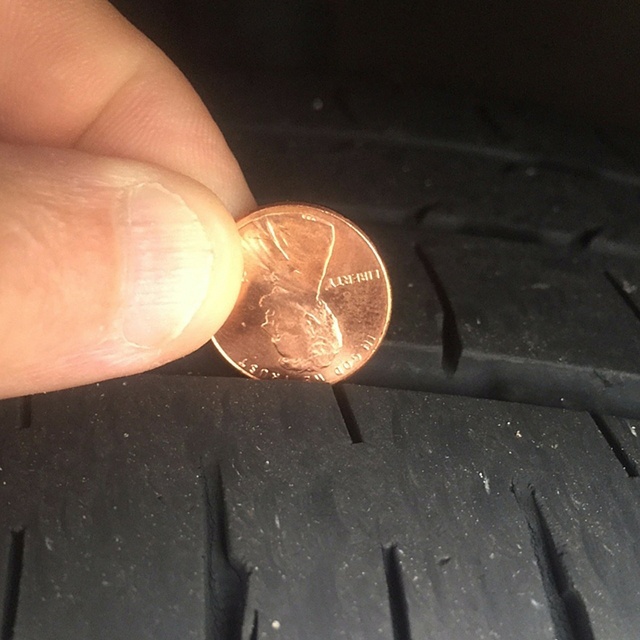 You can test the tread by inserting a penny into the tire grooves. Point Abe’s head down and facing you. If you can see his head peeking out from the grooves, it’s time for new tires. Shop online. In some cases, this can be a cost-effective move. There are many sites that sell tires. Some of the most popular are tirerack.com and discounttiredirect.com. Consider warehouse stores. BJ’s, Sam’s Club, and Costco are just a few of the big warehouse stores that sell tires. Keep in mind that there is a cost for membership to most of these stores, so – if you aren’t a member – do the math to figure out if you are saving money by buying the tires and the membership together. Know the correct tire size for your needs. Check the owner’s manual for your vehicle. Buying the wrong size can cost you in other ways, such as reducing the miles per gallon when you drive. Check for tire recalls. You can check on recalls and find other tips about buying tires by visiting safercar.gov, a website from the National Highway and Traffic Safety Administration. Look for rebates. Many of the online tire retailers, such as discounttire.com and mavistire.com, list rebate information. You can also find rebate information on the websites of tire manufacturers. The savings can be substantial. Don’t buy used tires. As tempting as the savings may be, steer clear of used tires. This is for your safety and the safety of everyone on the road. Match it! If you find a great price online and would rather buy locally, ask if the local salesperson can match the price that you want. Care for your tires. Reduce the need for new tires by taking care of your investment. Have the tires rotated regularly. Make a monthly check of inflation levels and wear. Little changes in your buying and spending habits, add up to big savings over a year. Get more great money-saving tips by following us on Facebook, Twitter, and Instagram!